Best of the Beatles for Viola - 2nd Edition by The Beatles. For Viola. Chart. Softcover. 96 pages. 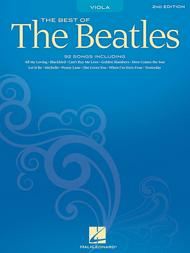 Published by Hal Leonard (HL.842117).ISBN 1423410483. 9x12 inches.This second edition features 92 Beatles tunes, including: All My Loving • Can't Buy Me Love • Eight Days a Week • Eleanor Rigby • A Hard Day's Night • Help! • Here Comes the Sun • Hey Jude • I Want to Hold Your Hand • In My Life • Let It Be • The Long and Winding Road • Michelle • Penny Lane • Revolution • She Loves You • Ticket to Ride • Twist and Shout • Yellow Submarine • Yesterday • and more.